Back in the late 1990s and early 2000s, the gastronomic highlight of a music festival might have been a suspect sausage, bland burger or flabby falafel, served from a dodgy-looking van out of Styrofoam containers. There was little if any choice or quality control over what you ate, but, then again, in those days festivals weren’t about food – they were about the music. But not so today. Over the past decade or so, the culinary credentials of field-based activities have become increasingly important to festival goers. Today, festival organisers put food and drink high up on the bill, with an eclectic mix of cuisine from quality producers. This is certainly true of All Together Now, the new boutique music festival which takes place this August Bank Holiday Weekend (3rd, 4th and 5th) in the exquisite grounds of Curraghmore House, in Co. Waterford. But what has us salivating is the fact that there is a food festival within the music festival. Food and Feast at All Together Now is the workings of Vanessa Clarke, the original brains behind Electric Picnic’s Theatre of Food. Incidentally, All Together Now, is the doing of promoter John Reynolds, the original founder of Electric Picnic. As you would expect from these two, there is not only a stellar music, comedy and arts line-up but a serious programme of food events too. The festival is drawing the creme of Ireland’s chefs and the best food producers and suppliers from Ireland and further afield. Treat your taste buds to food from London-based Carousel, The Hartery Kitchen, Home Fries, and The Donut Trike and tuck into dishes prepared by Richard Corrigan from BBC’s Great British Food Revival, Gary O’Hanlon from TV3’s The Restaurant, Current Irish Chef of the Year, Jess Murphy of Kai in Galway, Enda McEvoy of Michelin-starred Loam in Galway and Graham Neville from Dax in Dublin. Paul Flynn, from The Tannery in Dungarvan, will also be there and he’ll be preparing a Sunday Gospel Brunch, including bloody Mary’s and a soundtrack provided by the London Gospel Choir. For food lovers, these names are enough to be a line-up draw in their own right. 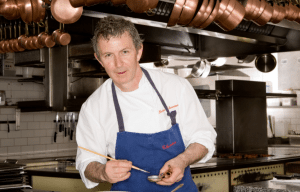 One of the festivals most exciting events will be hosted by chef Kevin Thornton, the first Irish chef ever to have received two Michelin stars. Food for Life by Kevin Thornton will be a one-hour long, three-course interactive dining experience, designed to tantalise all the senses. The dinner will be intimate and in the round. Being so close to gastronomic genius you are sure to come away from the experience with some new techniques and ideas to try out yourself at home. Kevin is a qualified teacher, who was involved in setting up the Culinary Arts degree course at Cathal Brugha Street and watching him work and listening to him talk passionately about all things food is a real learning experience. Kevin also has a keen appreciation for nature and passion for foraging, so it comes as no surprise to learn that the theme of the dining experience is land, sea and woods and will focus on seasonal, real and natural ingredients. Kevin is renowned for his skills in taking local, seasonal produce and turning them into innovative, contemporary dishes that reconnect with the natural world and tell the story of Ireland. In keeping with Kevin’s desire for us to ‘experience tastes beyond the walls of the restaurant. To push the boundaries of the senses’ the dinner will be held at sunset in a secret garden on Curraghmore Estate. As an extra treat, there will also be a lighting and photography installation of Kevin’s creative work. Kevin is an avid food and nature photographer and his book ‘Food for Life’ has been described by Food and Wine Magazine as “unparalleled in its beauty by any other food publication in Ireland”. When Kevin isn’t working his magic on ingredients in secret gardens he can be found in his home kitchen in Ranelagh helping home cooks expand their repertoire. Kevin’s new venture KOOKS is a family affair and along with his wife Muriel, they curate bespoke private dining events as well as welcome guests into their home for private Masterclasses and hold cookery demonstrations. The pair also lead seasonal wild food outings where they identify, gather and cook wild, edible wonders at various locations around Ireland. Through KOOKS, Kevin and Muriel aim to nurture and unlock the creativity in everyone through their love and passion for food. Tickets for Food for Life by Kevin Thornton at All Together Now cost €65 pp and they are very limited in number so email georgina@pod.ie if you are interested in attending this unique experience.